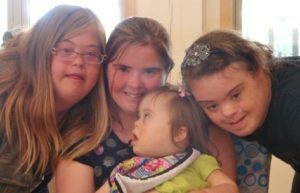 The Maritime Down Syndrome Family Camp at Brigadoon Village is an annual event organized by the HNSDSS and open to all families in the Maritime region (and beyond!). The weekend camp retreat (Friday night – Sunday afternoon) is a chance for families to meet one another in a relaxing and fun camp setting. Accommodation, meals, and program activities are included. Information regarding registration and costs will become available in our news section as each year’s camp approaches. Programming and activities include waterfront activities, sports and games, drama, art, wilderness adventures, campfires, and more. Programs are designed for the whole family, but there will also be time for parents meetings, and sibling-specific programming. Brigadoon Village is a non-profit, year round recreation facility in the Annapolis Valley, whose mission is to serve children, youth, and families living with chronic illness, conditions, or special needs. Click here for photos of the camp site. Our mission is to improve lives for persons with Down syndrome and their families through advocacy, education and support.